Paderborn - After a topsy-turvy game both SC Paderborn and 1. FSV Mainz 05 were happy to take a point from the Benteler-Arena on Sunday, even if the former were denied victory on their Bundesliga debut with the last kick of the game. 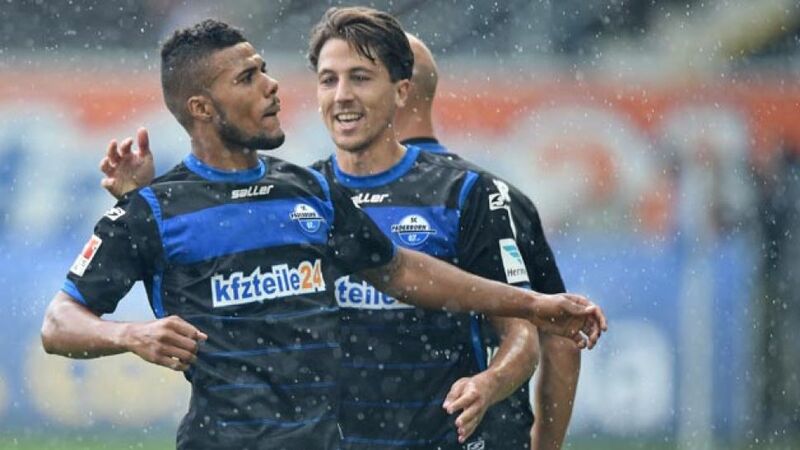 bundesliga.com rounds up the reactions of some of the game's key protagonists, including Elias Kachunga, scorer of Paderborn's maiden top-flight goal. Elias Kachunga: It was our first Bundesliga match today so I think a point is ok. Of course we'd have preferred to win though. We're new in the league and we'll keep learning. [For my goal] we benefitted a bit from the opposition but as a striker those are the positions you need to be in and I was happy to score our first goal. In the second half we tried to put them under pressure as we were playing well and we caused them some problems. We deserved to go in front when we did and to concede at the end was disappointing. We showed we can compete at this level and now we're looking forward to our upcoming matches and want to play well against Hamburg next week. Uwe Hünemeier: The penalty was just an unfortunate situation. I think anyone who watched the 90 minutes today will have seen what kind of team we are and the morale and mentality we have. We never stopped trying to score and create chances and I think we made life difficult for Mainz. That'll give us confidence going forward. Johannes Geis: We went 1-0 in front and I set it up but then it was my misplaced pass that helped them to make it 1-1. Then they scored in the 87th minute but fortunately we equalised again. We fought hard and showed that we won't give up so we have to be satisfied with a point. We gave everything to win all three points but we didn't manage it but I think it was a step in the right direction. Stefan Bell: I think we can be happy with the result. It reminded me a bit of the first half of the season last year when we drew 2-2 with Hoffenheim and equalised in the last minute. The point will give us confidence as it wasn't any easy game today. We gave away a goal that allowed them to make it 1-1 so we can be happy with the point.